Swedes Launched the Comets out of Town · Let's Go Amerks! It was only a matter of time before the abundance of Swedish players on the roster would lead the team to a win and that’s what happened on Wednesday night. Jonas Johansson (third star) had 25 saves in his first win of the season with Rochester, Rasmus Asplund (second star) had three assists, and Victor Olofsson (first star) scored the first goal of the game with his stellar shot. Alex Nylander had an assist as well and continued his streak of playing a great two-way game. The power play was held without a goal for the fourth straight game, which now makes it 3/45 in the last 13 games, but the team made up for it with five goals scored by five different players and seven players tallying assists in the game. Getting back to a team effort and relying on the details that brought them success to start the season was the talk of practice this week and it paid off in the win. A shot from the point appeared to bounce off of two different Utica Comets players and into the net. Assists to Rasmus Asplund and Victor Olofsson who had worked the puck around the boards to the point. Rasmus Asplund has played great hockey all season contributing in games but the points haven’t been there. That work paid off on Wednesday night with three assists. A pass to Olofsson at the hash marks, won a puck battle along the wall getting a pass to Andrew MacWilliam, and won another battle with 15 seconds left to clear the puck out of the zone and Wayne Simpson scored an empty netter. In the first 19 seconds of the third period Asplund was on the receiving end of a big hit from Zack MacEwen, Andrew MacWilliam took exception to that and immediately stepped in to drop the gloves. A sign of teammates taking care of each other. Matt Tennyson almost had a classic Gordie Howe hat trick (goal, assist, and fight). Alex Nylander sent a pass to the middle of the ice that may have been intended for Sean Malone but it went off of Malones skate to Tennyson who shot the one timer. Tennyson had an assist on the last goal of the game working the puck up the boards to Asplund. He also had a roughing penalty for mixing it up with Tanner MacMaster. There weren’t any actual punches thrown so the refs handed out roughing calls. Jonas Johansson was called up this week and was ready to play. In 12 appears with Cincinnati this season he had a record of 7-3-1 with a .912 SV% and 2.49 GAA. The decision will be made on Thursday about the goalie situation and what the next step is. 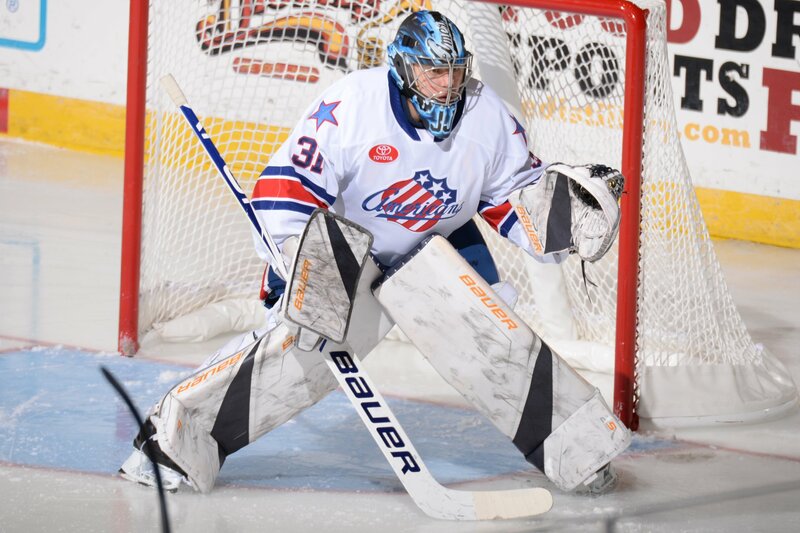 Things got a little tense with just under six minutes to go in the game when Utica pulled goalie Thatcher Demko when they were still down 3-0. Four goals over the last 4:14 of the game changed the atmosphere in the building from this is a win to the Comets having a chance. Utica scored twice, Rochester scored twice. Reid Boucher found some open space and sniped a shot by Johansson. Only 22 seconds later Wayne Simpson spotted CJ Smith wide open in the neutral zone to take off for an empty net goal. Jonathan Dahlen scored 68 seconds later with 2:44 left in the game as the Amerks were scrambling defensively. Wayne Simpson scored a short handed empty net goal with 11 seconds left in the game to end the late game scoring. Amerks have won three of the last four games and will have an opportunity to continue the pace with a home game Friday vs Springfield and then on the road in Syracuse on Saturday night.